In one case, the SEC’s Claims Review Staff (“CRS”) recommended that the Commission grant an SEC whistleblower award of approximately $4 million. In doing so, the CRS considered several SEC whistleblower award factors that it felt justified both the grant of the award and the amount of the award. The whistleblower did not appeal that recommendation. In its Order granting the award, the Commission adopted the reasoning and recommendation of the CRS. The Order mentioned several SEC whistleblower award factors that the CRS considered, and that the Commission accepted, in granting the award. First of all, the whistleblower satisfied the general criteria for receiving an award by voluntarily providing original information to the SEC that led to the successful enforcement of the SEC’s action. The Order described the whistleblower’s information as “detailed and specific”. 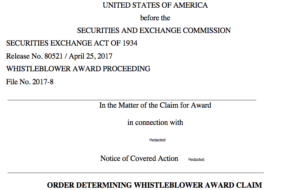 The SEC’s press release about the award added that the information pertained to “serious misconduct”. In addition, after initially reporting to the SEC, the whistleblower continued to provide the SEC with “extensive and useful ongoing assistance”. This ongoing assistance included the whistleblower’s “industry-specific knowledge and expertise”.